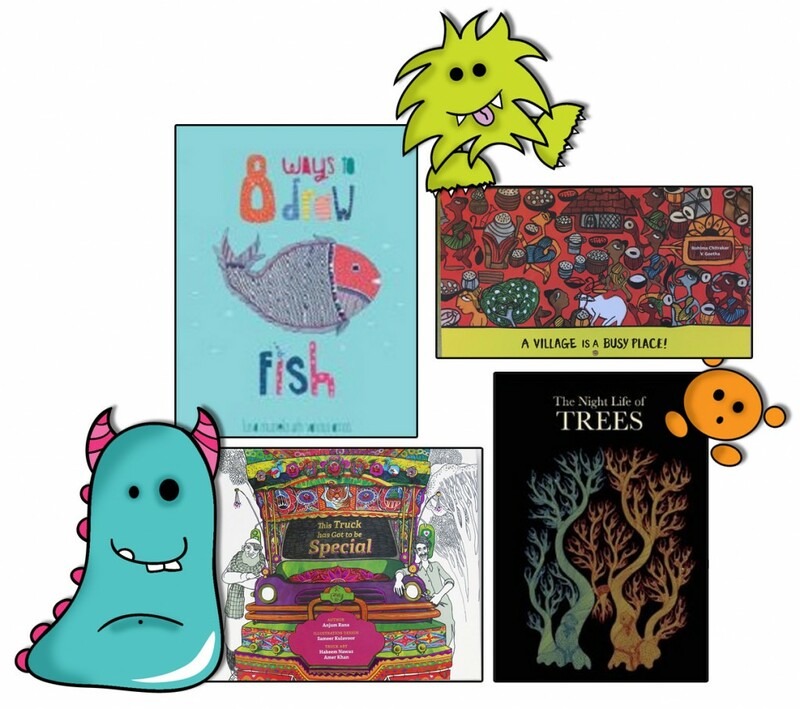 I was recently contacted by Tara books, to see if I would have a look at their books and maybe consider them for Book Monsters. Having looked through their catalogue, I was impressed, and since purchased on book and was sent another three. So this is going to be a rather epic, but also, exciting, blog post looking at these books! First up is a book I chose to purchase for myself, after looking at Tara Book’s Catalogue. It’s called The Night Life of Trees by Bhajji Shyam, Durga Bai and Ram Singh Urveti. Now this is a really rather special book, and not one I can even begin to do justice to with mere words. Suitable for both adults and children, each page depicts a different tree taken from the folklore of the Gond tribe in Central India. They believe that trees are central to life. Trees work hard during the day providing shelter, shade and nourishment, but when night draws in, the spirits in the trees reveal themselves, and it is these spirits which are so beautifully captured in this book. Each book is a number limited edition, and within the pages are illustrations, silk-screened by hand onto thick black paper, making each page a stunning art print. Alongside each tree illustration, is a story or snippet about the spirits inside. This is truly astoundingly well done. 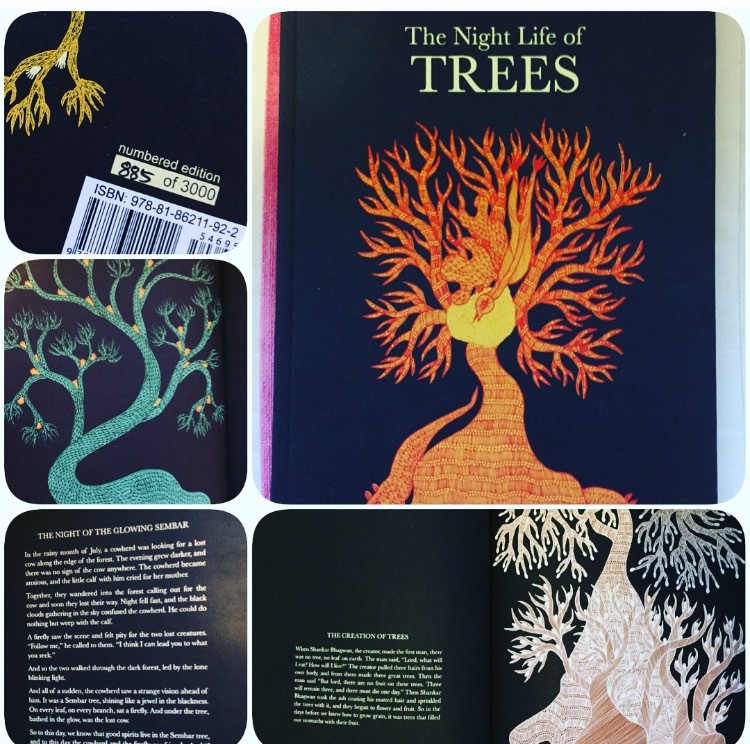 The text is sparse, and beautifully written, giving just enough detail, to absorb you into this folklore tradition, and on every page launches the most gorgeous brightly coloured and mystical tree that seems to dance off the page. Absolutely beautiful artwork. Everything about The Night Life of Trees feels sumptuous and special. The paper is thick and of beautiful quality, all lovingly hand bound and numbered, and in a large format, this book is a keeper for sure. No, not just that, it’s a treasure! Pure beauty in book form to be enjoyed and loved by all ages. Next up, we have more unique offerings from Tara Books, in this clever little creation. It is called A Village is a Busy Place! by Rohima Chitrakar and V. Geetha. This turns the traditional book on its head, with a little hole punched in the first page, you can hang it up, and unfold each page, scroll like. The book unveils, gradually, the life of the Santhal people through informative and questioning text, along with fantastically colourful illustrations in the style of Bengal Patua scroll painting. This is a really unusual way to present a nonfiction book, and it works wonderfully well. 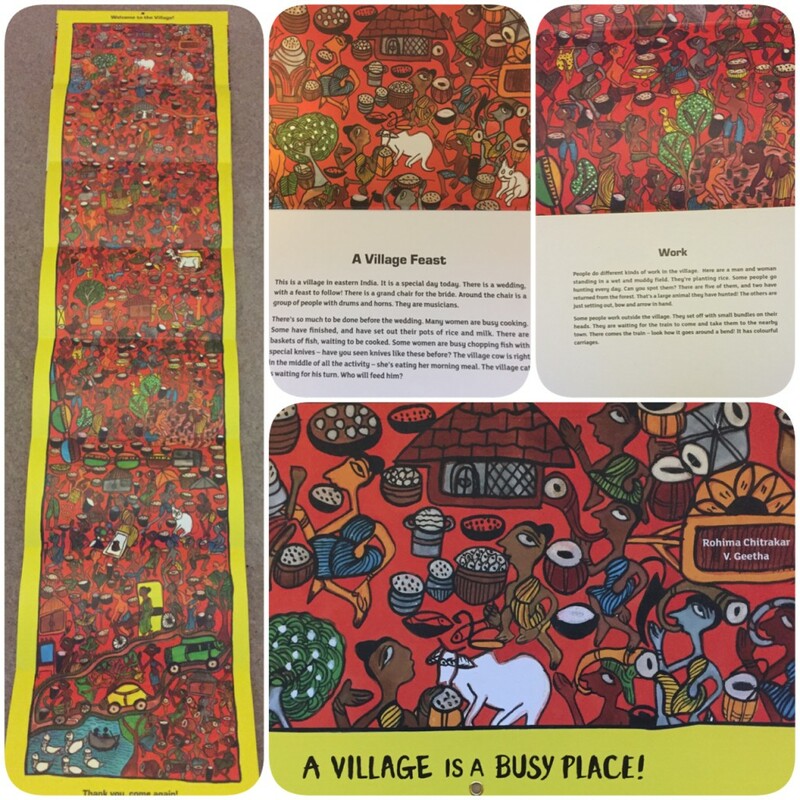 Each page gives a little information on what you can see in the picture, and explains village life, in a way that engages the children, and gets them investigating the pictures for themselves. Then it asks a couple of questions, to give children something to discuss and explore. It’s really interactive. The traditional illustration style is unusual, and not something all children will have come across, so that in itself is a fantastic jumping point for discussion. This book is bright, it’s colourful, it’s traditional and full of brilliant information, without being overwhelming for younger children. The pull-out scroll effect is unusual, and children will love this. It’s made out of thick card, so will take the constant scrolling and unscrolling too, which is very important. It would be great for children with dyslexia, because the book is so visual and the small amount of text is presented in a good clear typeface and nicely spaced. There is so much that is wonderful about this simple nonfiction book, it’s a creatively designed publication, with a huge amount of educational value in teaching children about different cultures, traditions and art. Perfect for schools in particular. My next from Tara Books is an activity book. 8 Ways to Draw Fish by Luisa Martelo and other artists. Activity books are becoming increasingly popular among publishers, who are recognising the importance of getting children interacting and engaging with books. Also, helping give children confidence to draw, I think, Is hugely important. Drawing can be a brilliant empowering skill to have, and is something everyone can do given the right guidance and confidence. This book has been expertly done. Printed as large format on nice thick paper it has the quality to allow children to run wild on it with paints or pens without tearing the paper. Done in a similar traditional Indian style of artwork, each page contains a combination of gentle grey lines, and bright colours, to encourage children to trace the fish, but also be creative in how they colour and detail a lot of the art giving them just the right amount of guidance, with the freedom to run free with their creativity too. 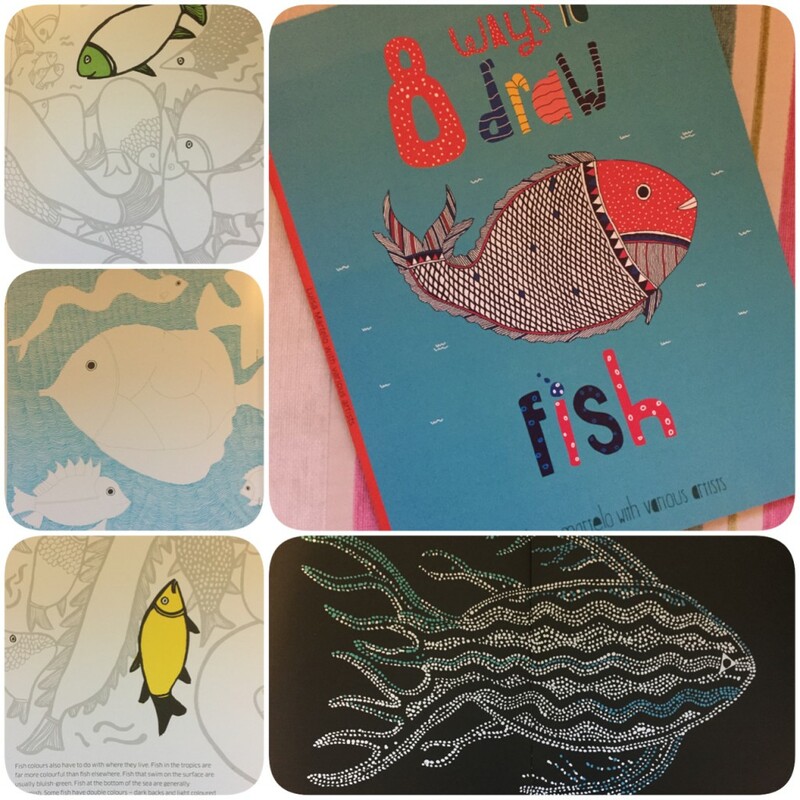 Alongside the drawing guidance, are little snippets of factual information about fish, their body shapes, where and how they live, all adding to make this book brilliantly educational. This book has wonderful artistic and educational value to offer children, but it’s also bags of fun. I know a few adults who would enjoy this too, as a form of relaxation, it’s an ideal choice. Last, but certainly not least, is a book ideal for older children called This Truck has Got to be Special by Anjum Rana, Sameer Kulavoor, Hakeem Nawaz and Amer Khan. 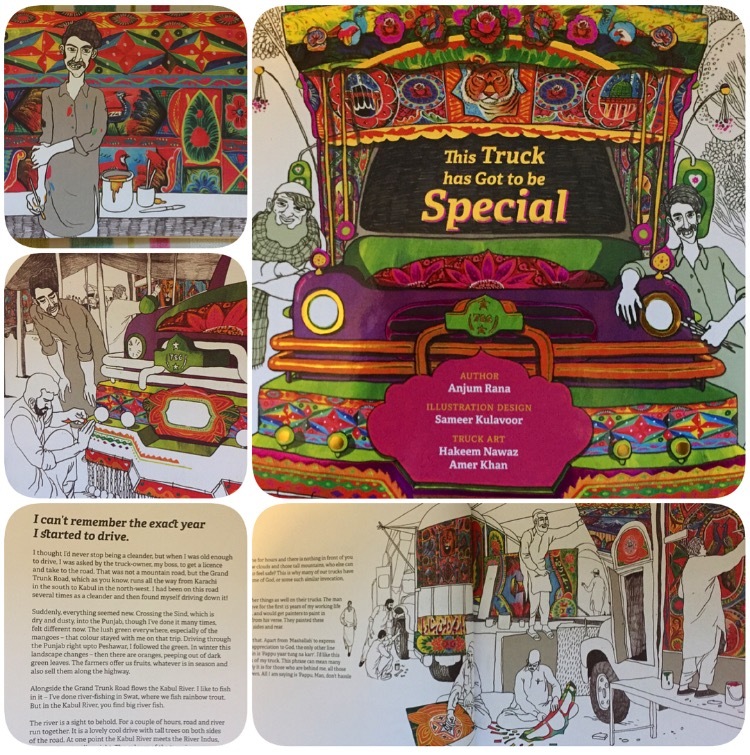 This book is an immense collaboration between Pakistani author, Pakistani truck artists and an Indian illustrator resulting in a wonderfully unique, colourful and fascinating read. Telling the story of truck driver Chinar Gul, who has finally been able to purchase his own truck, and wants it painted beautifully by a traditional Pakistani truck painter. The story veers from telling the tale of Chinar Gul and how he went from cleaner to his dream of truck driver, and owning his own truck, onto the story of the talented truck artist Zarrar and how the truck painters’ dedication and skill breaths life into these vehicles. Both stories intertwine really beautifully, as told from Chinar Gul’s point of view. It’s wordy, so a picture book for older children, but written in such a nice style that makes it lovely and easy to read. It feels personal, like you’re diving into their World, and that’s what books like this should be all about. An immersive experience into an exciting and traditional World that children may not otherwise ever get to see for themselves. The illustrations are a combination of line drawings in black and white, contrasted with the glorious technicolour of the stunning Indian truck designs. It’s so effective, and shows the work and effort that goes into these painted trucks and the importance of them to the artists and the truck owners. This Truck has Got to be Special would make a brilliant tool in schools and libraries for introducing children to traditional art and Pakistani culture in an engaging, interesting and beautifully presented way. The illustrations and storytelling are richly portrayed and exude a warmth and love of tradition and most importantly cultural pride which absolutely cries out to be shared with children. As an education tool it’s incredibly worthwhile, but in truth, like all of the Tara books I’ve looked at here, it just made me smile. It has a friendly approachable accessible and most of all happy feel. This book is a joyful celebration of Pakistani truck painters, of the drivers and their determination to do work hard and do something they love, of the mountain roads they drive through. There is so much to be gained from this book, that multiple reads will never be quite enough to take it all in. So there you have it. A wonderful selection of multicultural themed books from Tara Books, every one completely different and unique from each other, but also from anything else you’ll find out there. I believe books which teach parents, carers and children about other cultures are vitally important. Not all children are able to explore the world further than their own countries or even home towns and so we are responsible for bringing the world to them. These books allow us to do this in a most enchanting, interactive and engaging way. If you would like to purchase any of the above books, you can do so from Tara Books website. Also take a look at what else they have to offer there is a huge amount to suit your educational or leisure reads.